Datio POS News and How-To Posts | Blog: Thank you Don, for such an excellent review. Thank you Don, for such an excellent review. We received an excellent review from Don. Don J: "We have been using the Datio Point of Sale terminal in our hair salon since April of 2016. 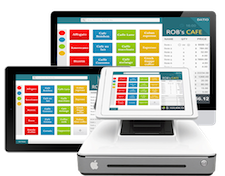 Before we acquired it, we did an extensive comparison of Datio to many of the other top cloud based POS terminal solutions including Square, Clover, Talech, POS Tablet, Revel Systems and several others. We compared functionality, cost of ownership, ease of use, reliability and looks. For our kind of business, Datio won the comparison study hands down. It took only 15 minutes to set up the terminal after we opened the box. We process a lot of credit cards and Datio has been very reliable. Datio's merchant services provider, Vantiv, gives us great rates on all cards including Visa, MasterCard, Discover and American Express. Our stylists really love the text messages they receive after each of their guests checkout. It tells them the amount of service sales and the tip. The reports are simple and straight forward. We have only had to make one service call. The technician was polite, helpful and solved the problem within a day. Bottom line, this is a great POS terminal that is low cost and is backed up by great support. We are recommending it to all of our friends and colleagues that have service businesses and retail shops." Thank you being such a valuable customer.